Having reviewed Take Control of Messages previously I was very interested to see what Take Control of iTunes 11 the FAQ has to offer. Take Control of iTunes 11 the FAQ starts with the introduction explaining the origins of iTunes. For readers who want to just use it without knowing all the ins and outs there’s a Quick Start section. Like all Take Control books you can get updates through the Take Control website. The usefulness of Take Control of iTunes 11 the FAQ becomes clear when you first start using iTunes 11, even for people who have used previous versions of iTunes. When Apple released iTunes 11 they changed a lot of things in the software, so finding things and how to do them became difficult for a lot of people. And like all Apple products there’s very little in the way of instructions, so this is where the Take Control of iTunes 11 the FAQ comes in really handy. One of the big changes that occurred in iTunes 11 is the integration of iCould directly in iTunes. There is a chapter in Take Control of iTunes 11 the FAQ that explains about iCloud integration in iTunes. This chapter covers things such as iTunes Match, viewing purchased content on iTunes, and it also touches on how to use iTunes Match on iOS. Also on page 136 there is a page that shows you how to find duplicates in your library, which is very useful. 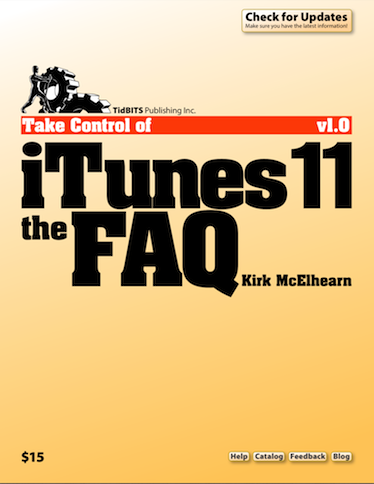 Take Control of iTunes 11 the FAQ also has extra content related to the ebook on its website; the links are within the book. Take Control of iTunes 11 the FAQ comes in all the normal ebook formats, PDF, EPUB, and Mobipocket. Which makes having it to hand much easier. Whether you are new to iTunes or a longtime user I highly recommend Take Control of iTunes 11 the FAQ. With so much covered in Take Control of iTunes 11 the FAQ I would be amazed if you had any unanswered questions after reading it. Instagrammification – but is it Art?